"This yummy family tradition started when buying the kids their pumpkins. Each of the kids got one to make their jack o'lanterns. Mama got one to cook! Friends and family usually enjoy this treat. Tweak it to fit your family as I do mine! Enjoy with confectioners' sugar on top or cream cheese frosting!" Mix white sugar and applesauce together in a large bowl; stir pumpkin puree and eggs into sugar mixture until smooth. Mix baking powder, baking soda, cinnamon, salt, ginger, cloves, and mace into pumpkin mixture; fold in walnuts and chocolate chips. Stir flour into pumpkin mixture until fully incorporated. Pour batter into the prepared loaf pans. Bake in the preheated oven until a toothpick inserted in the center of each loaf comes out clean, 1 hour. Cool in the pans for 10 minutes before removing to cool completely on a wire rack. 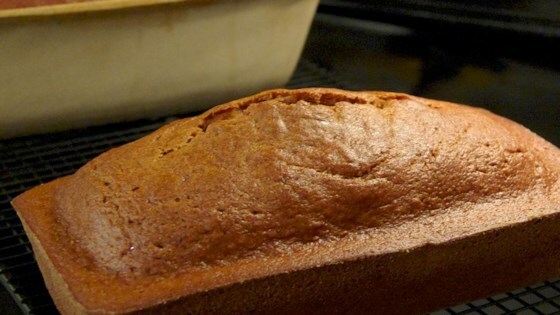 Sprinkle each loaf with confectioners' sugar. We prefer pecans and semisweet chocolate chips in our pumpkin bread. Most often I bake it in a 9x13-inch pan and once cooled, top it off with cream cheese frosting. Made half the recipe and used half splenda. Turned out perfectly as muffins. Pumpkn pie lke spice flavor and moist, not gooey. This was a hit! Moist and light, with a sweet and spicy flavor :) I left out the mace, chocolate, and confectioners' sugar, and used a 2 quart baking dish (9 x 13 inch pan).